+ POOL in New York isn’t simply another pool in New York City. It’s ‘the world’s first water-filtering, floating pool in New York’. It all started with three friends, an interesting, innovative idea and a Kickstarter project to make it happen. + POOL arose out of the conclusion that it was quite remarkable how this metropolitan city has so much to offer, except for clean water to swim in aside from regular pools. 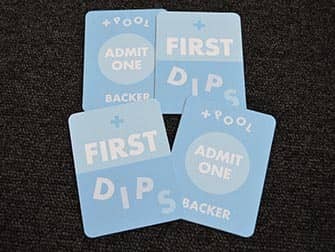 Instead of creating another regular swimming pool, the initiators of + POOL wished to make use of the actual, existing rivers. Basically just to make New Yorkers appreciate their rivers even better, by enabling them to swim in them. Instead of cleaning an entire river, they decided to take it step by step, and started out by cleaning just a ‘small’ piece of East River. 860m², to be precise. See it as a strainer that’s been dropped in the river. The ‘+’ in the name refers to the special features this Olympic-sized pool has. Also, the pool is actually shaped like a ‘+’. It works like this: the ‘+’ is floating in the river, and the walls are equipped with filters that remove all bacteria and contaminants, so that the water that enters the pool – almost 2 million liters a day – is clean and swimmable. This is done naturally, without the use of chemicals or additives. This pool is not just an amazing new piece of leisure, it’s also a good step towards cleaning the rivers of New York. 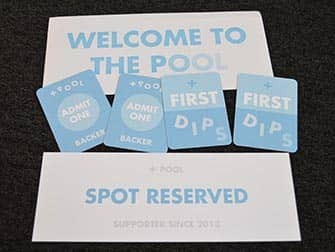 + POOL is supposed to become a spot for everyone. That’s why it is designed as four pools in one: a children’s pool, a sports pool, a lap pool and a lounge pool. + POOL opening date is not yet known. Presently, a temporary mini version of the pool called ‘Float Lab’ is going through a test phase at Pier 40 in Hudson River Park. It will float there all year round, to see how the filters manage to survive all seasons. Meanwhile, the tiles are already being produced; engraved with the names of every single sponsor that helps making this project happen.